The Search or the Shuffle/Repeat function of a certain number of NW-E403/NW-E405/NW-E407/ Network WALKMAN devices may not work correctly under certain conditions. In order to resolve this issue, a firmware update is provided. Press and hold the SEARCH MENU button until the MENU is displayed. If firmware version is 2.0, YOU DO NOT NEED TO UPDATE THE FIRMWARE OF YOUR NW-E403/NW-E405/NW-E407/ Network WALKMAN. Select NO and EXIT. Press SEARCH MENU to go back and exit. NW-E40X_V2_0C.exe - 2239 Kb (depending on the model you have). Check that the downloaded file is 2239 Kb. If not, delete the file and repeat step b. Before going further you need to back up all the data contained in your NW-E403/NW-E405/NW-E407/ Network WALKMAN to your computer and free up at least 3MB memory on your Network WALKMAN. To back up the data, read the information below. On your computer, go to the C:\ WMFWUPG folder and double-click NW-E40X_V2_0C.exe depending on the model you have. 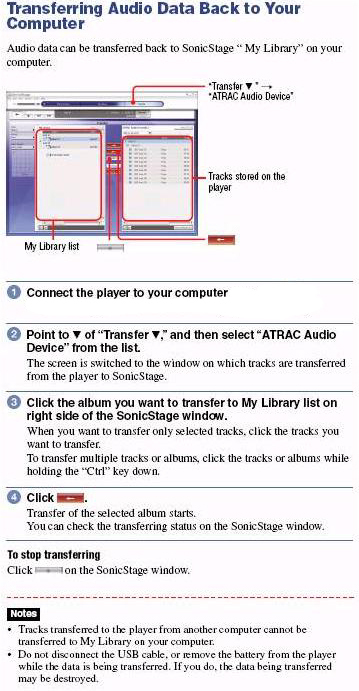 Click Close to exit and connect the Network WALKMAN to upgrade. Open the folder contained in the C:\ WMFWUPG folder and double-click FWUpdater.exe and follow the onscreen instructions. Do not disconnect the USB cable even if USB Connect is not displayed on your Network WALKMAN or if your computer displays that no USB device is connected. The firmware update is completed.